In this paper, we introduce the study of prize-collecting network design problems having general connectivity requirements. Prior work considered only 0-1 or very limited connectivity requirements. We introduce general connectivity requirements in the prize-collecting generalized Steiner tree framework of Hajiaghayi and Jain , and consider penalty functions linear in the violation of the connectivity requirements. 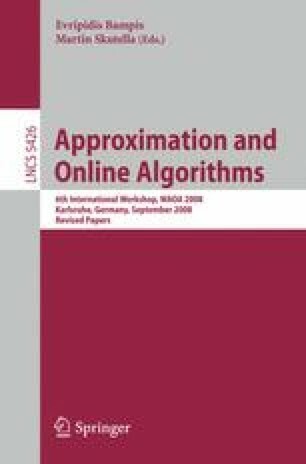 Using Jain’s iterated rounding algorithm  as a black box, and ideas from Goemans  and Levi, Lodi, Sviridenko , we give a 2.54-factor approximation algorithm for the problem. We also generalize the 0-1 requirements of PCF problem introduced by Sharma, Swamy, and Williamson  to include general connectivity requirements. Here we assume that the monotone submodular penalty function of Sharma et al. is generalized to a multiset function that can be decomposed into functions in the same form as that of Sharma et al. Using ideas from Goemans and Berstimas , we give an (αlogK)-approximation algorithm for the resulting problem, where K is the maximum connectivity requirement, and α= 2.54.